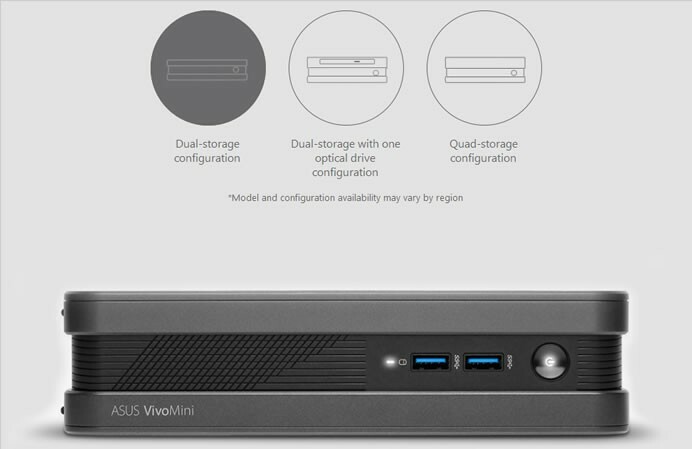 Asus VivoMini VC65 Series minis PCs feature a versatile modular design with three storage and optical drive configurations for increased performance, productivity, and entertainment. Asus VC65 and VC65R mini PCs are the world’s smallest mini PCs that can accommodate up to four 2.5-inch SSD or HDD storage modules. Asus VivoMini VC65 Series mini PCs are designed for a wide range of computing tasks for the home or office. VivoMini VC65 Series mini PCs are powered by up to the latest 2.8GHz 6th-generation Intel Core T Series processors to give them the performance required to run processor-hungry applications and render ultra-realistic 4K UHD visuals. The top-of-the-line VivoMini VC65R model features built-in RAID support, making it ideal for a network attached storage (NAS) or mini server system. VivoMini VC65 Series minis PCs have a compact 2-liter chassis with a Zen-inspired spun-metal finish. An innovative embedded power adapter design helps save space to give users more flexible placement options — the PC can be placed horizontally or stood vertically on its side, and can even be VESA-mounted on a wall or the back of a monitor. An easy-access slide-open chassis makes upgrading effortless. VivoMini VC65 Series mini PCs can be ordered as a barebones model as well, so users can specify their preferred operating system, memory card, and storage options to meet their needs. 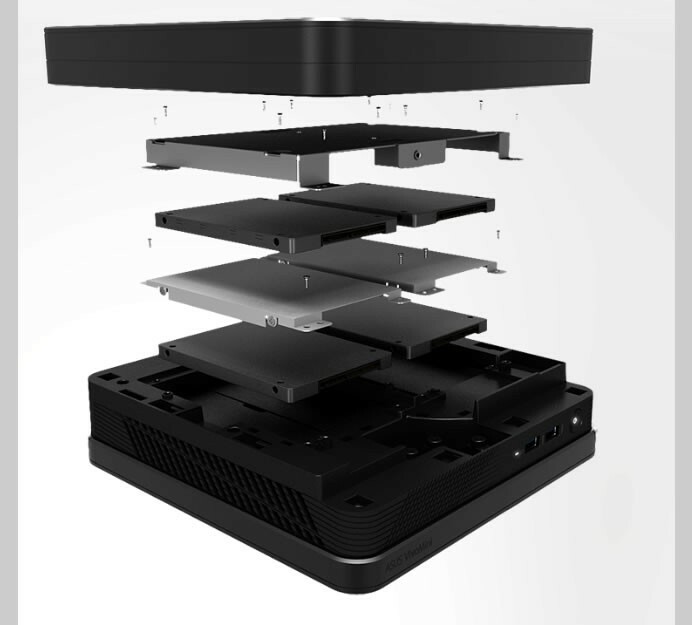 VivoMini VC65 Series mini PCs have a versatile modular design and feature three configuration options straight from the factory. This unique design accepts 2.5-inch SSDs or HDDs to give users the flexibility to mix and match storage options to suit their needs. VivoMini VC65 Series mini PCs support up to four storage drives, making them ideal for use as NAS or server systems, for datacenter use or for video editing platforms with super-fast RAID data speeds. Models fitted with two storage modules and an optical disc drive are designed for daily multitasking computing and entertainment, while the dual-storage configuration option provides a capable mini PC for work or play. Asus VivoMini VC65 Series mini PCs feature multi-display-support to give users more onscreen desktop space to make multitasking easier; they can even extend a single window across several displays. 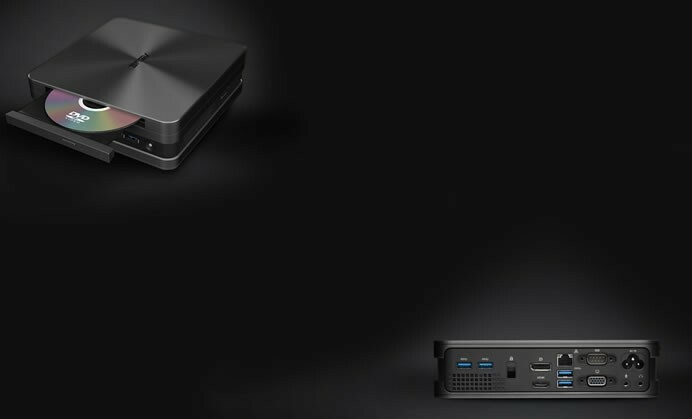 These mini PCs are compatible with any monitor, HDMI-equipped TV, or projector. There are full connectivity features including six3 USB 3.0 ports, a 4-in-1 card reader, an audio-output jack, as well as HDMI, DisplayPort++, VGA, and COM ports. A Kensington lock slot is provided for added security. VivoMini VC65 Series mini PCs deliver incredible energy efficiency — drawing as little as 15W at idle. They are remarkably silent as well, generating as little as 21dB of noise at idle, and 35dB at full load.